This team was created by Town Manager Brandt to better manage, monitor and report on the Town assets such as; roads, buildings, IT, sanitary and water systems, pipes, fleet and equipment, parks, street lights, to name a few. Jenn Gross, a GIS Analyst for the Town presented. It was noted that the Town’s asset plan currently does not have enough detail in it to satisfy government reporting requirements. New software and processes will enhance accountability and transparency and enable the Town to better prioritize asset repair and replacement. How will we pay for it? The cost will will be brought forward for consideration in the 2018 budget with a possible levy impact of 1%. Alderman Berry stated that “we’re raiding capital reserves” to do work now that we haven’t set aside enough money for. He would have liked to see this levy in the 2017 budget, stating he realizes it’s a tough budget year. Some other municipalities have started an “unallocated” infrastructure reserve fund through levy charges. Infrastructure replacement such as watermains are already captured in our levy. Alderman DiFlavio stated it’s important to have a detailed accounting of what’s currently covered in the levy and that any additional tax/levy must show the need for it. Mayor Bentley was concerned that the Town had lost out on infrastructure funding because our asset plan looked *too good* – – how would this new approach impact our ability to access funds? If we do a really good job, we don’t look like we’re in need. Brandt responded that it’s a double-edged sword – – the more sophisticated our plan, the better we are able to demonstrate our needs and priorities. On the flipside, the less assets in the “red” area then the harder it is to get funds. There is an opportunity to apply for OCIF “top-up” funding, details at: https://publicsectordigest.com/…/ontario-infrastructure-fun… Once this new initiative is in place, Council will need to review the asset reports and determine what level of service and priorities they want. The AquaBlu draft plan of standard condominium raised concern again regarding the amount of parking. Alderman Mullins stated that she was concerned that there would not be enough parking. AquaBlu was approved to have shared visitor parking with the office building (not built yet and so that parking isn’t part of this condominium approval), and the AquaZul development was approved to have shared visitor parking with the office building, then that office building was approved to have some of their shared parking located on the AquaZul property. Sounds confusing doesn’t it? You get the picture, it’s much like a carnival shell game with developer’s raking in the money. The whole site has reduced parking, shared parking, and not enough parking…. and our Aldermen approved it that way. Alderman DiFlavio stated that Winston Road will be fully closed for six months for roadwork and adjacent development, most likely in 2018. He said people will need to be patient for a few years while they try to deal with parking piece by piece. Alderman Dunstall commented that the West End is supposed to be a complete community and he hopes that new purchasers will use public transportation (which we don’t have yet, so they’ll have to bring their car – then see if they’ll give that up). The new name for the Winston neighbourhood, “Grimsby on the Lake” was discussed. Alderman DiFlavio mentioned this would be put on an arch over the road. Alderman Berry asked if the Section 37 community benefit money was only for the West End. Alderman DiFlavio clarified that the arch was paid for out of development charges already accounted for in the neighbourhood plan, as well as potentially a clock tower. The Section 37 monies to be received (for height bonuses above the maximums in the OP/Secondary Plan) are to be spent in the West End after discussion with the community. Only $200,000 from LJM has been agreed to (but not received) and it would be used to help those who feel adversely impacted by the increase in height, a concept which almost sounds comical. 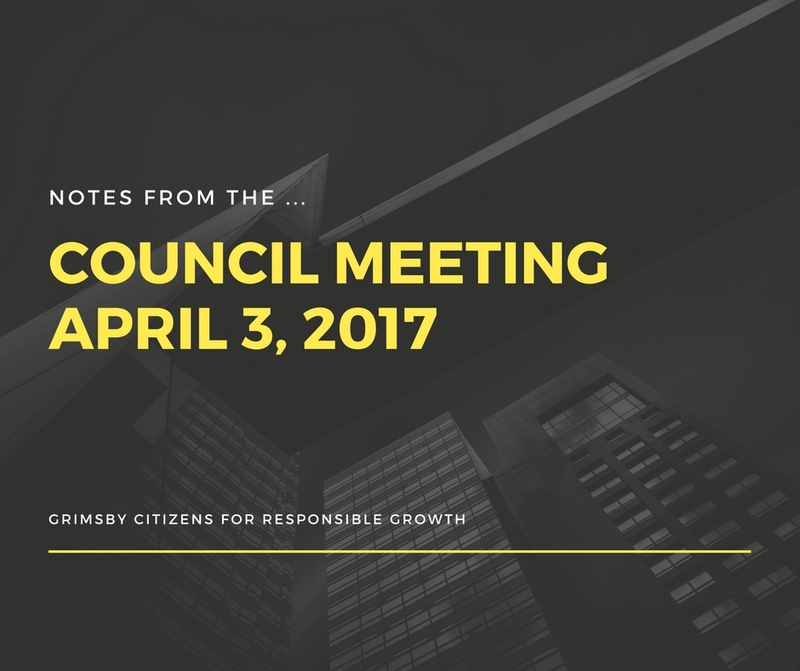 The LJM 15-storey development is currently under appeal to the OMB by Grimsby Citizens for Responsible Growth. On March 23 Niagara Region “endorsed in principle” the creation of an inter-municipal transit system for Niagara Falls, St. Catharines and Welland. In order for this bylaw to come into effect, it must be approved and adopted by the majority of Niagara Region’s municipalities representing the majority of Niagara’s population. Currently, the Region operates Niagara Region Transit as a pilot service; this “triple majority” process would be needed to make an inter-municipal transit service like this permanent. Grimsby taxpayers contribute 6% of the general levy for this service. Alderman Kadwell has received a number of citizen inquiries regarding the tree clearing of the AquaZul property. In response, Councillor Quirk noted that there is a regional tree bylaw that would come into play if there were any species of interest/risk or a significant woodlot. Alderman DiFlavio stated that this site was vetted by the NPCA at the site plan stage and no level of government opposed it. As well, the edge of the development was mainly shrub/brush with some mature trees in the centre. Wherever possible, there is an attempt to save trees but in this case, it was not possible. Alderman Kadwell noted that there had been another accident recently at Ontario Street in the “Diamond”, the ramp area of Ontario Street and the QEW. He discussed introducing three possible safety measures with MPP Sam Oosterhoff: flashing red lights on the stop signs, rumble strips (by the fire station), or an advance warning light (when coming down Mountain Street). More developments to come on this issue.